Today I am going to be writing about rainforests and what they are and also what is inside them I hope you enjoy! The tropical rainforest contains far more species of plants and animals than any other biome on the planet. They cover approximately six per cent of the Earth’s surface, and because they get 2,000 mm of rain per year and temperatures range from around 27 to 32°C, conditions are wet and hot all year round so it is a good environment for growth of crops. 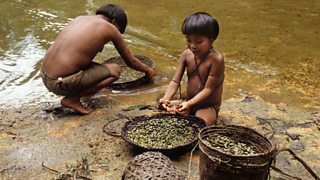 In some areas there is pressure to use rainforest resources to help development but this can lead to resources being exploited in an unsustainable way. Some developers are willing to do anything to make money but there would be long-term negative impacts for the whole planet. The challenge is for the governments of poorer countries to protect large areas of forest. They have difficult decisions to make about how to use their resources. Plants grow thick leaves with drip tips and waxy surfaces to allow water to drain quickly to prevent rotting. Some plants called ‘epiphytes’ are flowering plants which grow on tree trunks and branches to get light. 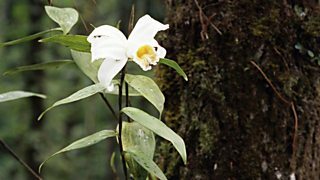 They get food from the air and water, and their roots hang in the air, eg orchids. Carnivorous plants are meat-eating plants that attract insects using smelly nectar and then trap them. 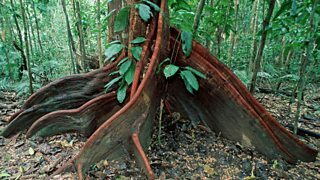 Rainforest soils are poor and most nutrients are in the top layers, so roots are generally shallow. Wide buttress roots join the tree far up and help to support it. They also allow the tree to gather more nutrients. Only a small percentage of the animals live on the forest floor. Many live in the trees. It is thought that in the Amazon rainforest there are over 2,000 species of birds and 1,500 species of fish. There is also thought to be 50,000 kinds of insects in a single square mile. Wow thats a lot of Animals! People are an important part of the rainforest. The indigenous people live in traditional ways in harmony with the environment. They live in groups called tribes. There are around 400 tribes in the Amazon rainforest. Each one has a unique culture and way of living and they have learnt to harvest food and resources from the forest in a sustainable way. They are also hunter-gatherers. These people are really connected to nature and will be completely away from technology. I hope you guys have all enjoyed todays post and if you have please leave a like and pass my post on to your friends. If this is the first time my writing is on your screen then please follow my blog.